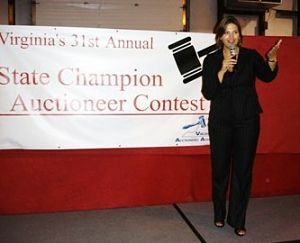 It’s been three years since I last competed in the Virginia Auctioneers Association (VAA) State Champion Auctioneer contest. In 2009 I took 3rd place (2nd runner-up, as they say). You can see photos from that event here. Since then, I’d not entered the contest. In part, I’ve been busy growing my business. But another reason was that I hated the heat. The facility — though very nice and the owner always arranged for this awesome BBQ — wasn’t air conditioned. There I’d be, in a light wool suit with string-y hair from my sweat and the makeup melting off my face. The men were uncomfortably warm, too. But they have short hair and no makeup. So even though I liked the competition, I had that memory rolling around in my head. It wasn’t something I was eager to repeat. While there, I struck up a conversation with the current reigning Virginia champion, Taylor Linkous. He asked if I’d be competing in the Virginia contest. “I’m a bit of a sissy with that heat. I really hate wearing a suit in it,” I said. Well, shucks. He was right. 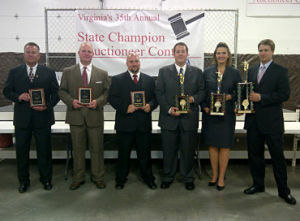 So I drove south to Richmond this past Saturday — the normally two-hour drive took FOUR hours, thanks to traffic — to compete in the 35th annual Virginia Auctioneer Championship contest. And I won 1st runner up! I’m excited about this for a few reasons. I made a slight improvement over my 2009 performance. This year, money was awarded in addition to a trophy. I got $300. Anyway, I was pleased with my performance so I can’t beat myself up over anything I did or didn’t do. And I want to congratulate all of the finalists, whom I’ve listed below. The line-up is from right to left, so Brian is on the right, and H.L. is on the left. Thanks for encouraging me to enter, Taylor. And to all 14 contestants, I applaud your courage for stepping up and competing. It can be nerve wracking when you’re being judged by others in your industry. Way to play! Salmon or pork turd: Which would you eat? School benefit auction catalog need some bling? Try a ring. Congratulations, Sherry! Whether you do auctions four times a week or 50 times a year, anyone who has you as an auctioneer is getting the best in my book! Congratulations for not only placing second but for doing so in what is clearly a male dominated field. Great job! Thanks, Skot! I’ll be in your area (New Castle) conducting a benefit auction on October 20. If you find yourself wanting for something to do that weekend, I know the NH SPCA would love to have you attend.